Introduced in the 2011 Jeep Grand Cherokee SUV, Chrysler's new Pentastar V-6 engine will soon be available in the Chrysler Town & Country, 300 and 200, and Dodge Charger, Avenger, Durango and Journey. Chrysler Group said today it plans to make its Pentastar V-6 engine available on 13 models, a move that will result in improved fuel efficiency, more horsepower, weight savings and reduced emissions and manufacturing complexity. 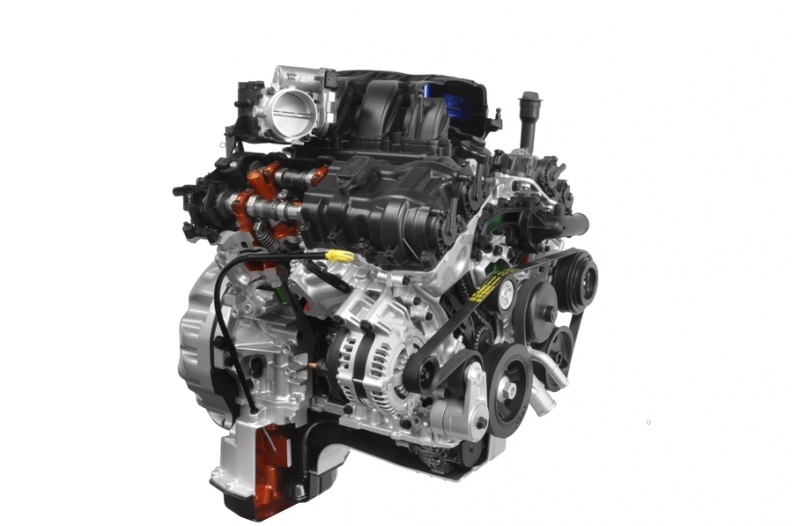 The 3.6-liter Pentastar V-6 -- the most advanced six-cylinder engine ever produced by Chrysler -- will become the automaker's workhorse engine and will replace seven V-6 engines over the next three years. It is expected to account for more than a third of the powertrains offered by Chrysler by 2014, and improve the automaker's average corporate fuel economy by more than 25 percent. The Pentastar V-6 was designed to be compact and lightweight, and can be used in front-, rear- and all-wheel-drive models, Chrysler said. It was introduced on the 2011 Jeep Grand Cherokee. A 3.6-liter version tuned to get 305 hp will debut on the 2011 Dodge Challenger. Chrysler said the Challenger version will provide a 55-hp boost over an outgoing V-6 and enhance fuel economy to 18 miles per gallon in city driving and 26 mpg on the highway. The boost in horsepower for 2011 will put the Challenger on par with the Ford Mustang. As the Pentastar V-6 is introduced on more models, Chrysler plans to phase out seven V-6 “legacy engines' that range in size from 2.7 to 4-liters. Some of those V-6 engines were developed jointly with former parent Daimler AG. Chrysler said the engine will run on regular 87-octane unleaded fuel, as well as on E85 blended gasoline. It will also allow Chrysler to reduce major engine components from 189 parts to 32. It is 94 pounds lighter than the 3.7-liter engine it replaced on the Jeep Grand Cherokee and 42 pound lighter than the 3.5-liter it replaces in the Chrysler 300 sedan. On minivan models that were equipped with a 4-liter engine, horsepower has been increased by 32, to 283. And the new Dodge Charger will feature a Pentastar V-6 with 292 hp -- 42 more than the current model. The engine is assembled in a new $364 million plant in Trenton, Mich., as part of the $730 million Chrysler invested in the Pentastar program. Chrysler says the Trenton site will be able to produce more than 400,000 Pentastar engines a year. A second factory in Saltillo, Mexico, also is scheduled to assemble the new engines.